I recently attended a golf seminar. I figure I need to do things like that in order to keep up with what is being taught out there as “The Gospel of Golf According to [place name of semi-famous golfer here].” I’m astounded at how complicated some golf pros try to make the golf swing seem. Now don’t get me wrong, the golf swing is an amazingly complex task. 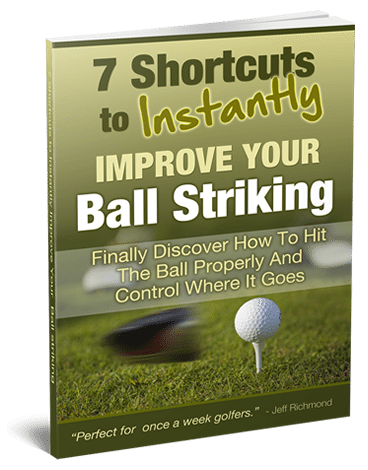 It requires a huge amount of practice to master it, and it requires even more continual practice to maintain a good swing. I also believe it’s vital to get professional instruction to help you on your way. The issue I have, I suppose, is that some pros (not all) appear to be trying to convince you that they’re really smart. Maybe by overloading you with an endless amount of cues and swing thoughts, they think that it’ll give you incentive to pay them a visit and pay them for their overly complex advice. Back to my story. This golf pro was talking about balance and how important it is during the golf swing. I totally agree. You certainly can’t swing a golf club if you’re falling over all the time (sorry, I couldn’t resist). While I agreed on the level that balance is important, I was more than disappointed in his method of how a golfer should go about improving his or her balance during their golf swing. Here’s what this golf pro did. He flops these two dyna-disks down on the floor and stands on them. Now for those of you who don’t know what a dyna-disk is, it looks like a frisbee that went back for a third helping at Thanksgiving. It’s round, a couple of inches thick, and mushy. If you stand on them, there is a constant shifting of your feet in an attempt to maintain your balance. The pro says that he performs controlled (in other words slow) swings while standing on these mushy frisbees, and it improves his balance when he stands on the ground taking his regular swings. Better balance means you can generate more power. Well that just sounds like a brilliant idea! In fact, if you watch him do it, it looks like it’ll work. Nope. It makes for a nice circus trick, but if you’re not rehabilitating some type of injury, it won’t make you a better golfer. In fact, it could very well screw up your swing AND reduce your power. Here’s what’s wrong with this type of balance training for golfers. In order to keep your balance on an unstable surface, your brain uses what is called feedback mechanisms. Feedback mechanisms use information from your eyes, central nervous system, and proprioceptors (position sensors in muscles and joints) to help you maintain your balance. This is an ongoing process for as long as you stand on the squishy disks without falling off. The problem here is that during a dynamic activity like a golf swing we use what is called feedforward mechanisms. Because of the high-speed nature of a golf swing (less than 2 seconds), golfers don’t have time to react with feedback mechanisms. They must rely heavily on a visualized and internalized image of the swing. In other words, you feel and see the swing in your minds eye before it occurs. Therefore, using this type of balance training doesn’t even apply to a task like the golf swing so you are wasting valuable time that you could have used to actually practice more effectively. Remember how I mentioned before that the golf pro would perform slow swings while balancing on the disks? The reason he did them slowly was because if he did them fast he would lose his balance and fall. Let me ask you a question. Is timing a very big issue during a golf swing? Do you think that trying to swing a club on a constantly shifting surface would alter the timing and pattern of the muscles that you recruit to swing a golf club? Of course it would. The activity of the muscles would be dependent on which way your body was swaying at the time (feedback) and not necessarily how you intended them to function in you predetermined golf swing (feedforward). 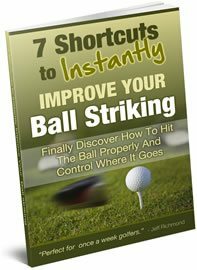 The end result is poor timing of your golf swing, and you certainly don’t want to carry that poor timing over into your golf game. Al Vermeil, strength coach for the world champion San Francisco 49’ers and Chicago Bulls, uses a saying, “Train Slow, Be Slow”. What he means is that training the muscles in slower motion versions of the actual task (golf swing) will teach the muscles to function slowly. Balancing on a dyna-disk forces you to slow down your swing. Your weight shift from back foot to front foot will be slower. Teaching muscles to function slowly in a golf swing will reduce your ability to load and unload key muscles, which generate your power, which in turn reduces club head speed. That means less driving distance. When you stand on an unstable object, your brain uses any number of strategies to maintain balance. It may make an adjustment in the ankle or knee or hip that will cause alterations in your trunk posture to maintain your balance over your feet. Attempting to perform golf swings on the dyna-disks will force you to alter your swing axis during your practice swings. My concern with this is that you may be creating a negative transfer to your golf game by teaching yourself an ineffective postural strategy, thus resulting in hitting fat or thin shots during your golf game. So what does science and experience tell us? So what can you do to improve your golf-specific balance? Play golf. There is not a gadget or exercise which will improve your golf-specific balance like playing golf. Because nothing can duplicate the demands of playing golf other than playing golf. I know, it sounds silly doesn’t it. If you look at other athletes in any sport from martial arts to gymnastics to hockey, you’ll find that they simply perform their sporting skills over and over to acquire their amazing balance skills. They don’t rely on silly, useless gadgets. If you were a tightrope walker, would you practice on a wooden beam or stand on a stability ball. Of course not, because it would not duplicate the demands of tightrope walking. The rope has its own “feel” and sway that nothing else but a tightrope can duplicate. So here’s the bottom line – if you want to improve your golf-specific balance, play golf. *Reference: Siff, MC. Facts and Fallacies of Fitness. Fifth Edition. 2002. About the author: Bill Hartman, is a Physical Therapist who has a degrees in Movement and Sports Science. Training golfers since 1990, Bill is a Certified Strength and Conditioning Specialist (NCSA), USA Weightlifting Sport Performance Coach and a Level 2 Active Release Techniques Practitioner (ART). Bill also has advanced training in shoulder, knee and spine rehabilitation as well as many methods of strength, power and speed training.